“I just bought a new computer”. Normally this is something someone will post to FB, grab a few likes and move on, however the computer I recently purchased is pretty unique, so I thought I would share it in a more detailed post. 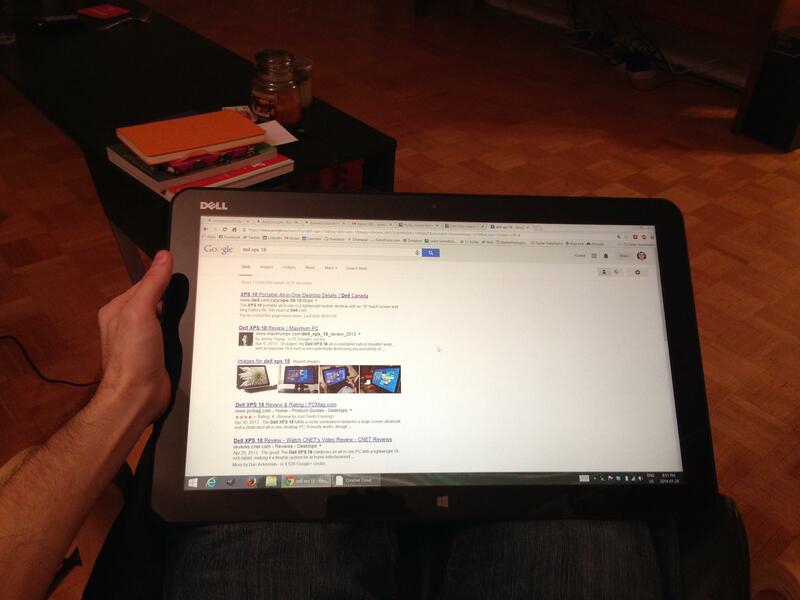 I recently picked up the Dell XPS 18, an 18-inch All-in-One / tablet. You read that right. It’s essentially an 18-inch tablet. Except, well, it’s not. The Dell XPS 18 functions primarily as a desktop. It’s large screen size means it has a full-size monitor “built right in”. It’s secondary purpose is as a tablet. 18 inches is pretty massive for a tablet but the picture below will hopefully make the use-case a little clearer. You see, the XPS 18 is not meant to be held in one hand like smaller tablets; instead it is perfect company resting on your lap on your couch. It comes with a charging stand that you can set up on your desk and when you want to relax with it on the couch, you simply grab it off the stand and away you go! You can see in the main image (above) that it is a very flexible device. You can lie it flat, stand it up, put it in the stand or hold it in your hand. I was pretty excited about the Surface Pro 2, an amazing tablet that operates as a full desktop, but the price tag blew me away and the 10-inch screen was lacking, considering I would use it primarily at my desk. There were very few machines that were both portable and powerful with good screen real estate. The XPS 18 is definitely the best of both worlds. It weighs 5 lbs so it is easy to grab off the stand and carry around, it’s quite fast and comes with ample storage (500GB). Complete with 8GB of RAM, it can run anything you throw at it easily, with the exception of intense games. So if you’re looking for a new desktop with some versatility, try the Dell XPS 18. It does help that I got it on sale for $699 down from over $1,000.